Kuchipudi is a classical drama based dance of Telugu Desha. The present-day Andhra Pradesh was earlier called Telugu Desha. The northern border of Tamil Nadu is Andhra Pradesh, which has its own classical dance form, called Kuchipudi. Kuchipudi originated in the village Kuchipudi in the Krishna district of Andhra Pradesh, near the Bay of Bengal. And later this dance form acquired the name of the village Kuchipudi where it originated. Initially, it pertained to a particular caste only. In other words, originally the Brahmin caste male members only practised this traditional dance drama. The role of males in Indian classical dance forms is immeasurable. In many Indian classical dance forms, such as the Kathakali, Kuchipudi, Odissi and Bhagavata Mela, were only performed by male dancers in ancient times. During the later years, the females started participating in some of the classical dance forms, except the Bhagavatha Mela and Kathakali. Originally, the Kuchipudi was performed by males alone but now females are the main dancers. Kuchipudi has very close similarities, to the Bharatha Natyam. In Bharatha Natyam, drama-oriented dance form is called dance drama. On the other hand, Kuchipudi is essentially a drama based dance. In Bharatha Natyam, dance dramas are generally based on music, while in Kuchipudi dialogue takes place in between the dance. Such dialogue based dance dramas never take place in Bharatha Natyam. As other Indian classical dances, Kuchipudi is also based on Natya Sastra. It is generally said that Siddhendra Yogi an orphan Brahmin contributed to the origin and development of Kuchipudi. Earlier Siddhendra Yogi was known as Siddhappa. Siddhendra Yogi wrote a play Bhamakalapam. It is based on the Vaishnava cult. This theme is especially oriented with Lord Krishna, Satyabhama and Rukmini. Carnatic vocal music is the sole music of this dance. This dramatic dance performance normally starts with stage ritual rites. Earlier, the male dancers dressed as female dancers. But later females started playing important roles in Kuchipudi. Today, Kuchipudi is the classical dance form of Andhra Pradesh and female dancers are the main participants. In Kuchipudi, oral conversation, takes place, between the dancers and musicians. Kuchipudi derives its main source from outstanding treatises of the dance of Nandikeshwara’sAbhinayaDarpana and Bharatarnava. It is said that the Kuchipudi dance style is further divided into two main varieties. One is the Nattuva Mala, and the other Natya Mala. Nattuva Mala is further divided into two. One is the pooja dance, supposed to be performed in front of Balipitha in the temples. The term Balipitha means the place in front of the sanctum of the presiding deity of the selective temple. The other is the Kalika dance supposed to be performed in KalyanaMandapam. However, the Kalika dance is further divided into three different varieties. One is the dance for ritual purposes, and the other a dance variety for intellectuals and the third a dance for the common masses. The Natya Mala is the main variety initiated for the development of the present day Kuchipudi. 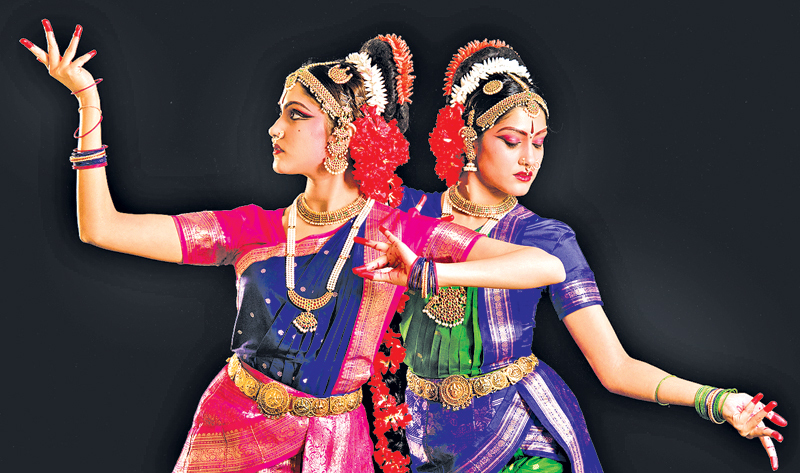 Some of the items are common to classical Bharatha Natyam, MohiniAttam and Kuchipudi. For instance, the item Sabtham is common to Bharatha Natyam, MohiniAttam, and Kuchipudi. There is a resemblance between Bharatha Natyam and Kuchipudi in the use of adavus, in the use of Jathi sequences, and Abhinayas. The colours and patterns of costumes, hair decor and ornaments, are almost the same in Bharatha Natyam and Kuchipudi. Kuchipudi like Bharatha Natyam is essentially a solo dance. It is mainly based on Puranic and Ithikasas like other Indian classical dances. Tharu and Tharangam are some of the attractive and special items in Kuchipudi. The resemblance between Bharatha Natyam and Kuchipudi arose because Andhra and Tamil Nadu were a single entity called Madras Presidency until 1953. Tharangam is a unique item danced on a brass plate. Dancing with brass pots, filled with water kept on the head, and legs placed on the edges of a brass tray is one of the most attractive items in the Kuchipudi dance. Sometimes the Tharangam dancer holds two oil lamps in her or his hands while balancing metal pots containing water on the head. The Bhagavata Mela is another Indian drama based dance form that has close links with Kuchipudi. Yet, the Bhagavata Mela dance drama is still preserved and practised by males only. The special feature of the Bhagavata Mela is preserved and practised only by the male Brahmin community. But the Bhagavata Mela dance drama has laid down a firm foundation for the development of dance drama, in Bharatha Natyam.